Tight-Lacing - Is the Red Nose from the Corset or Liquor? On first reading an 1867 article against tight lacing, a modern reader might think that the publication was unusually progressive. In fact, the article hid worse tyrannies than fashion could produce -- those of hiding real problems and of teaching women to blame themselves. The Lady's Friend, although written almost entirely by men, diplomatically listed "Mrs. Henry Peterson" as publisher. The monthly ladies magazine first appeared in 1863 and had a brief career under the publishing house of Deacon & Peterson of 319 Walnut Street, Philadelphia, Pennsylvania. In the issue of October 1867 (volume IV number 10), the column Editor's Department contained the article "Dress Versus Health". There is "the case, which we published in THE LADY'S FRIEND at the time, of a young lady placed at a boarding-school where a seventeen inch waist was the rule, and suffering infinitely in being brought within that compass. It seems the only singularity of her case was that she complained of the torture. Others took it as much a matter of course as women in China do the bandaging process that insures them a beautiful stumpy foot. The same reasons exist in both countries. As they are ladies not necessitated to earn a living, they can do without health and strength -- genteel beauty they must have." "If girls knew the harm they do themselves by tight lacing, surely they would desist. They may not feel the effects now, but wait 'til they arrive at a maturer age. How many mothers have around them a family of poor, puny children, some of them perhaps crippled or deformed and for which they have only themselves to blame, having given way to the folly, to call it by no worse name, of tight lacing!" ..... "For which they have only themselves to blame"! In the nineteenth century in the United States a woman was judged by her peers on the basis of a very few things, chief among those criteria being her ability as a mother. Children born in American cities in 1867 suffered terribly from want of fresh foods, clean air and decent sanitation. Country children fared some better but their diets and health were dependent on the seasonal conditions. By 1867 physicians knew of the debilitating effect of diet on a child's health, but the author of The Lady's Friend article chose to blame a woman and her supposed vanity if the children were "poor and puny". To add the "blame" of producing "crippled and deformed" children to tight lacing was not only also inaccurate, but cruel and helped to delay research by suggesting that the "solution" was already found. "if young ladies would devote a little more time to learning how to make a home happy and feed a family, and a little less time considering the ways and means to getting their waists 'just one inch smaller,' we should hear less of comfortless homes, and husbands driven to the club thereby..."
A neat bit of maneuvering there! In an effort to make herself more attractive to her husband a woman is therefore driving him away, so a man should not be blamed for being "driven" to attend club. It is his wife's fault! Another curious "closed door" opened by the article is the discussion of liver disease "caused by tight-lacing" and the statement that if women did not lace so tightly they would "also have fewer complaints of red noses... (both of which complaints dance attendance on tight lacing)." The mind numbing constrictiveness of women's lives in the mid-nineteenth century drove many women to alcohol -- a situation almost never acknowledged or discussed. 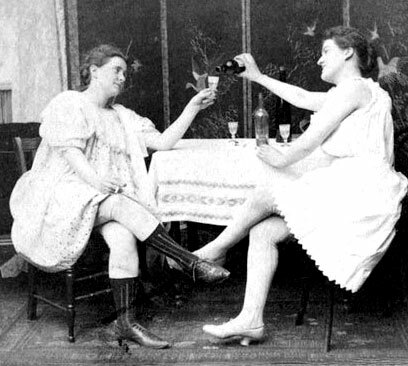 It was publicly considered unthinkable that a woman would drink to excess. 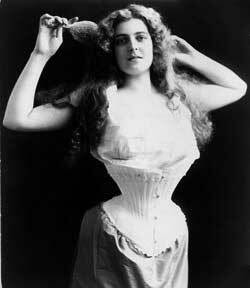 Symptoms of alcohol use, therefore, are here attributed to tightly laced corsets! "Gentlemen do not admire it [tight lacing]. They gaze after it, as at a spectacle, but it is to wonder and to blame. Of course there are exceptions. As a man is born of woman, a falsity in taste is liable to be to handed down from mother to son; and we can nowhere find the headquarter of this fashion but in the fancy of women." So if a man admires unnatural slenderness, it is still the fault of women -- it is the fault of the mother who reared him! Sadly, the original readers of The Lady's Friend were women who were rarely taught to read between the lines and who accepted much of what they saw in a publication on face value. Period diaries and letters attest to the fact that women indeed blamed themselves (rather than their husbands, economic conditions or surroundings) if children were ill or if the husband preferred to be elsewhere than his home. Would that with the change in fashion from tight lacing a corset to the natural look woman had ceased to take upon themselves so much blame! ABOUT THE AUTHOR: Heather Palmer, has served as the Curator of three historic house museums and was also the Historian of Blair House, the President's Guest House. She lectures at colleges and publishes articles in the fields of 18th and 19th century women's lives, clothing and needlework, and in the area of material culture. She does free-lance editorial work and writing.